Too Good to be True is another book by Kristan Higgins. I seem to eat her books like candy and can’t stop reading them. Isn’t it lovely when you find an author that you adore? I did with Kristan Higgins and I can’t thank her enough for her books. This one is the story of Grace and Callahan another hilarious and wonderful couple. Grace has curly, crazy hair. “Must remember to call exorcist to see if I could have the evil demons cast out of my hair, which had been known to snap combs in half and eat hairbrushes.” I simply love that sentence. What a great way to describe her hair. Grace is also a bit of a soft hearted person. She reads to the elderly, thinks her insane family is charming and will do anything for her younger sister. This last bit is what gets her in trouble, because her younger sister is going out with non other than her ex-fiance. Grace, being who she is, she encourages the match, then goes and makes up a fake boyfriend so her sister won’t feel badly about going out with her ex. The imaginary boyfriend becomes something of a legend and Grace goes to all sorts of hilarious extremes to keep him alive and her sister from finding out. Meanwhile, she spies a burglar trying to get into the house next door to hers and whacks him on the head with her hockey stick. The ‘burglar’ is of course, Callahan who doesn’t find her antics as funny as I did. He absolutely hates her and things don’t get better when she hits him again with a rake and her little dog bites him. I, however, was laughing out loud by this point. One of the things I liked best about this book, and Kristan Higgins’ books in general, are her secondary characters. Though they’re always different, they’re always funny in a cute, quirky way. This book had that in spades. From the elderly, grumpy grandmother, to the artsy mother, the smaller characters were amazing and made me laugh out loud. Finally, there was a wonderful love story. I was definitely rooting for Grace and Callahan and couldn’t turn the pages quickly enough to get to their happy ending. When it did come, it was wonderful and worthy of every sigh of delight I uttered. I really want to recommend Kristan Higgins. I can’t believe I waited this long to find her and she’s definitely going on my automatic-buy list. If you haven’t tried her before, take it from me and don’t miss out. She’s fantastic. Too Good to be True, winner of the RITA award, is yet another of her delicious creations one I’m keeping for good. Catch of the Day is a light, contemporary read. It’s got sadness in it, but it’s also got comedy and a set of characters that kept me turning pages. It’s by Kristan Higgins, who seems to find a way to turn any story into an addiction for me. She’s that good. Catch of the Day tells the story of Maggie. Maggie is awesome. I loved that she owned the only diner in a tiny coastal town. She greets the locals every day and brings meals to shut ins and any local fundraisers. Not only is she super nice, she’s also super-kind. Finally, she has a dog, an elderly lab named Colonel who’s just a gentle soul and who I instantly adored. Poor Maggie has a problem, though. Everyone sees her as either a daughter or a sister, so there are no possibilities for romance or even a date. Her twin sister, Christy is married and has a beautiful little baby and, while I would be totally jealous, Maggie babysits for free and adores both her sister and her niece. Before you get the impression that Maggie is just perfect, let me dispel that. Maggie has the terrible tendency to talk…her mouth off. When she has a crush on someone, she tends to tell everyone…and that tends to spread in her little town like wild fire. She also tends to like impossible men, like the town’s priest. Thankfully, Maggie and the priest stay friends and we get to meet Malone, a gruff fisherman with a heart of gold who rescues Maggie out of more than one fix and then steals her heart. I make it sound so simple and straightforward but there’s a lovely story here, with great characters and an awesome doggie. Catch of the Day was absolutely heavenly for me. It had humour, great, easy writing, good twists that I didn’t seem coming and a great ending. It was so good, I cut my conversation on the phone with Hubby short so that I could finish it–and I had really missed him. If you’re a contemporary fan, definitely give Kristan Higgins a try. If you haven’t read her before, this one is a great place to start–though I have yet to find one of her books that I don’t devour in a day. 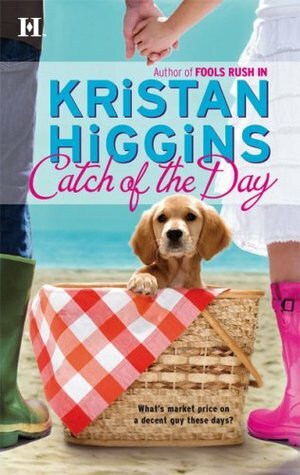 And if you like something with romance and a great sidekick with soft brown eyes, Catch of the Day is definitely for you. A great summer read.